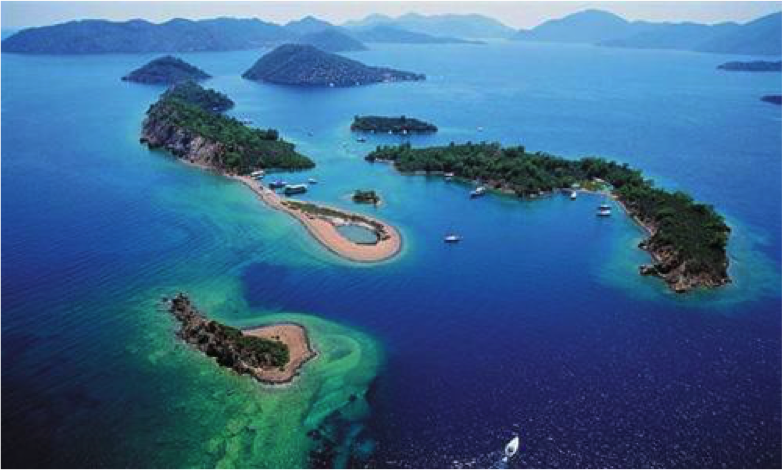 Board your yacht at Gocek. 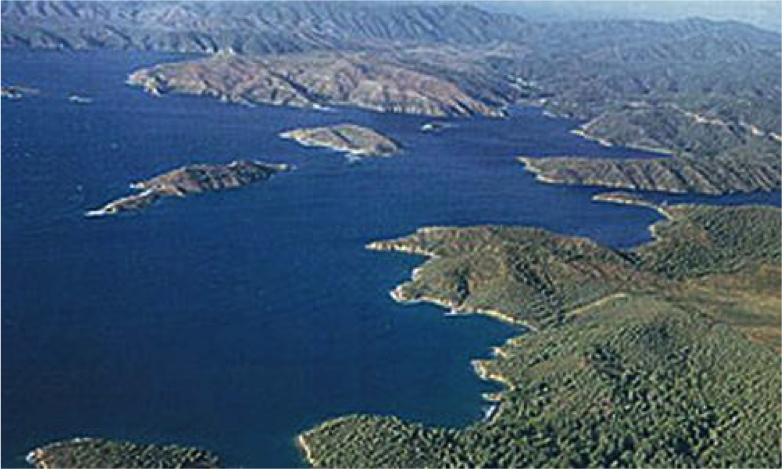 After spending sometime in Gocek town cruise for the overnight anchorage of Gocek island. Dinner aboard the yacht in this most tranquil of settings. An early morning departure for Gemiler Island, stopping along the way for lunch and the opportunity to swim and snorkel in clear blue waters. 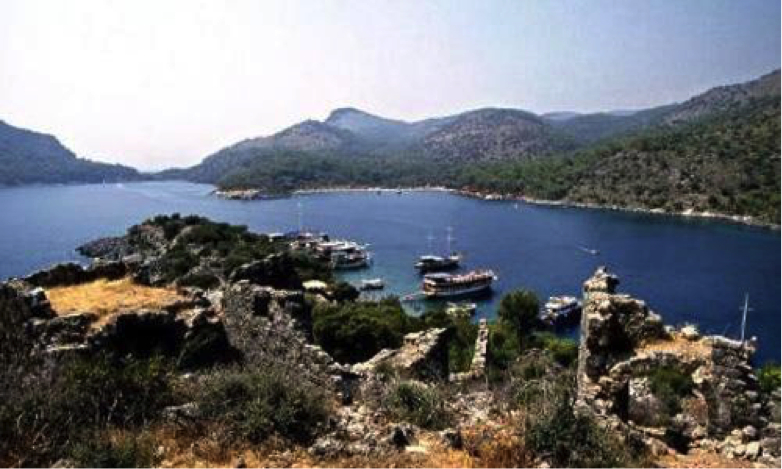 Arriving at Gemiler in the afternoon, go ashore and explore fascinating ruins dating from Byzantine times - including a covered walkway leading to the water's edge and a church with partially excavated mosaic floors. Just before sunset, make your way to the summit and enjoy the magnificent spectacle of the sun disappearing below the horizon. Overnight at Gemiler Island. 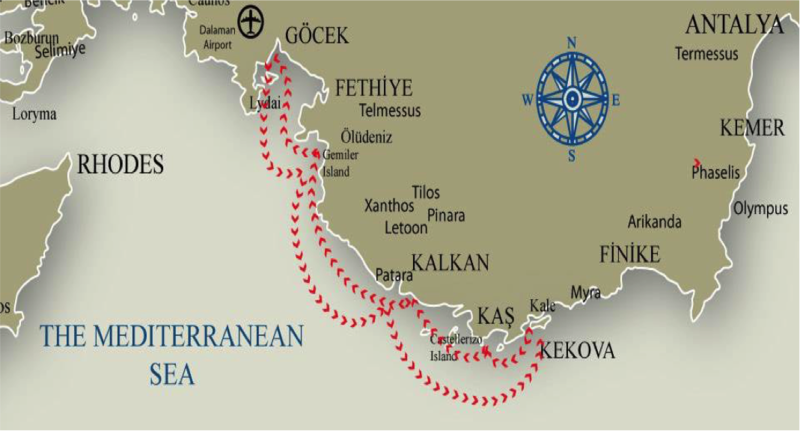 Cruise to Kalkan. 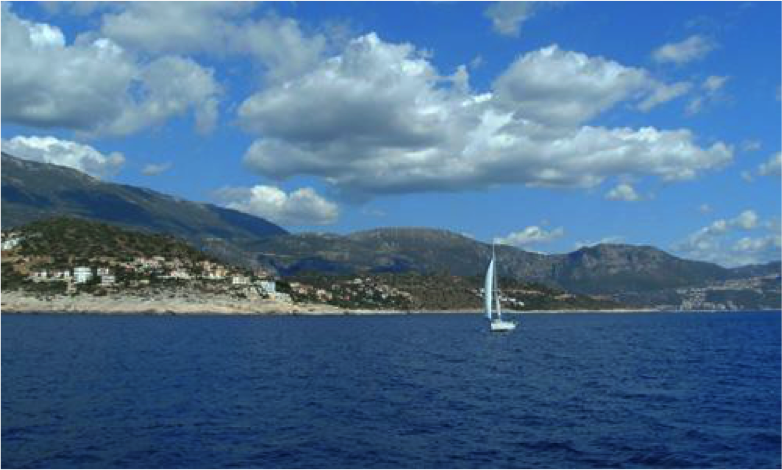 Kalkan is a pretty coastal town set on a hillside overlooking the Mediterranean. 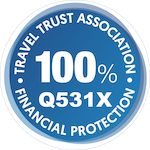 Once moored in the small attractive harbor, go ashore to explore the narrow streets where bougainvillea and jasmine spill from the balconies and the local vendors sell an amazing variety of merchandise. Overnight in Kalkan. To the region known as the Kekova Roads for a visit Kekova Island, Ucagiz and Kale Koy (ancient Simena). The "sunken city" is located off Kekova Island and as the water is exceptionally clear, it is possible to make out the outlines of the buildings. Following an earthquake, the land subsided and took the remains of a settlement with it. Ucagiz is a small village with a couple of restaurants. Take a walk from here to view rock-tombs, the remains of a fort and several sarcophagi. 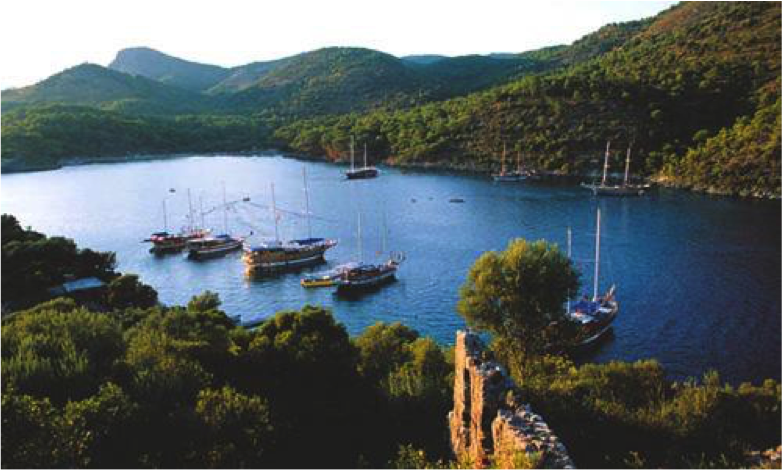 The highlight of a visit to the Kekova Roads follows an uphill climb to the medieval fortress of ancient Simena, crowning the hill above the village of Kale Koy. The view from the top is breathtaking. After breakfast, cruise for the delightful seaside town of Kas and spend the afternoon exploring the pretty harbor streets. If there is time, take an overland minibus tour to the ruins of three Lycian cities: Xanthos, Patara and Letoon and learn a little of the history of these proud people. Overnight in an anchorage near Kas harbor. 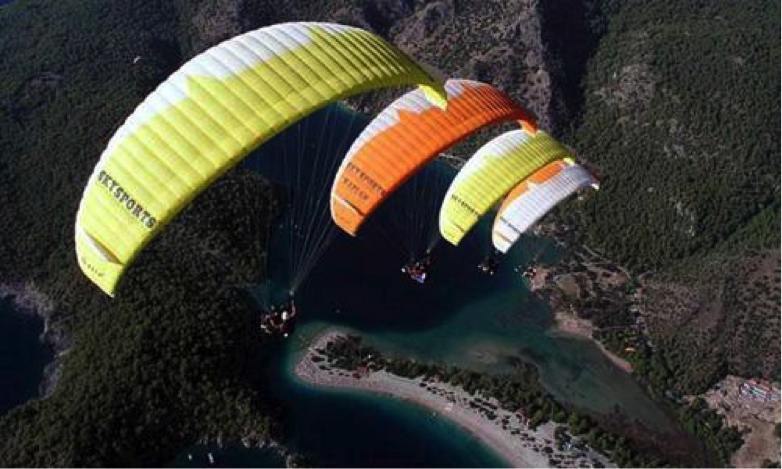 You will make an early start and cruise past the Seven Capes, stopping off for breakfast near Olu Deniz. After lunch at Coldwater Bay, take a hike up the hill to the Greek "ghost town" of Kaya Koy and relax with a cold drink in the shade before returning to the gulet. This evening will be spent in the clear waters of Karacaoren, a superb place for snorkeling with some small islands dotted about the bay. 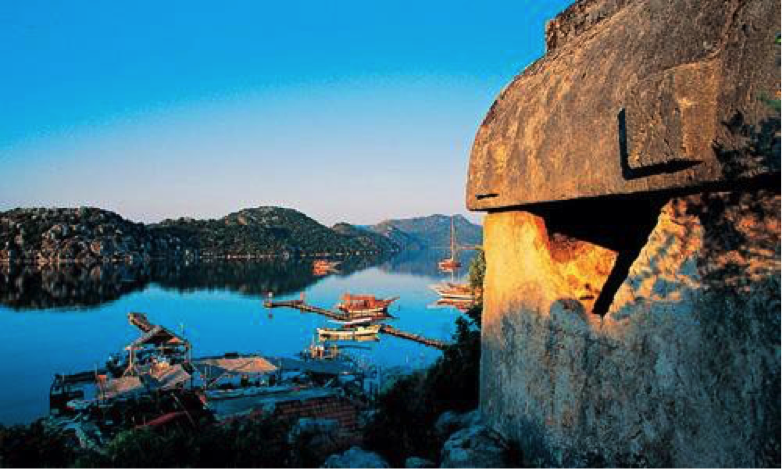 A day for exploring the many pristine bays and anchorages in the Gulf of Fethiye. Perhaps go ashore on Tersane island and view the Byzantine ruins of a shipyard, or examine up close the party-submerged ruins in Cleopatra's Bay, rumoured to be the remnants of the bathhouse in which Cleopatra is said to have bathed. Bedri rahmi bay, Manastir bay.